Some say “girls go to college, to get more knowledge; boys go to Jupiter, to get more stupider” and and others recall that “girls mature faster than boys.” Whether it’s a schoolyard taunt or a commonly-used excuse about puberty, both can now be attributed to the disparity of genders in higher level classes. In a number of classes at Parkdale, from English to math, the distribution of female and male students is strikingly uneven. For higher-level classes, like Honors and AP, there are generally more girls than boys. The reasoning behind this disparity could be psychological. The illusory truth effect, introduced in 1977 in a research paper by Lynn Hasher, David Goldstein, and Thomas Toppino explores the idea that the human psyche equates repetition with truth. If boys and girls respectively hear throughout their entire lives “well, he’s just a boy” and doing wrong isn’t “ladylike,” they may start to believe that as fact. Another point that is repeated often throughout adolescence is the idea that boys should focus on athletics. While athletics are a crucial part of the high school atmosphere, some male student athletes have a primary focus on just making the required 2.0 GPA. As a result, they may not want to risk being ineligible by taking higher-level courses. Some boys’ athletic teams at Parkdale have struggled with keeping all of their key players eligible. On the other hand, however, many female student athletes find a balance between academics and athletics. The Lady Panthers Basketball team are prime examples of that with an overall team GPA of a 3.7, according to Parkdale Security guard and Lady Panther Coach Mr. Watson. Aside from student athletes, the general population of male and female students also experience disparities in enrollment in advanced classes. Some attribute these differences to just girls and boys being different. Others, however, feel that societal expectations are what is creating this huge divide. Whatever the case, this difference is not biological. Instead, it could be because of what boys and girls are persuaded to focus on. 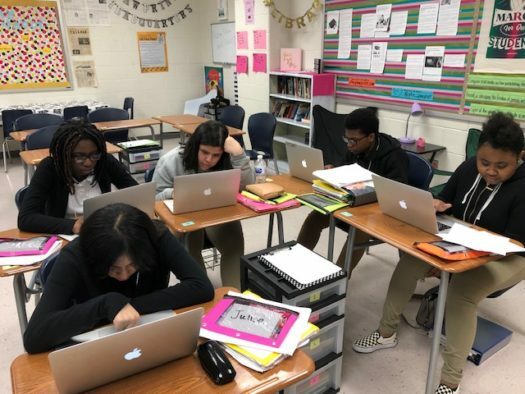 The Advanced Placement English Literature course, which is categorized as a humanities course, at Parkdale has a total of 43 students, 13 of whom are male students. That means only 30 percent of the students in an AP humanities class are boys. On the other hand, one of Parkdale’s honors chemistry classes, a STEM course, has a total of 49 students, 24 of which are male students. This makeup is roughly half boys, half girls. These gender make-ups between the honors chemistry class and the Advanced Placement English Literature class classes at Parkdale could be because of the presumption that STEM (science, technology, engineering, and math) is for boys because it consists of “manlier” courses, while the humanities and arts are for the girls. Even still, according to the College Board, in 2017 the AP Biology enrollment had 97,015 males while there were 157,255 female students. This shows even in STEM classes, there are about roughly 25 percent more girls registered in AP classes than boys. College Board additionally stated that in 2017, English Literature & Composition class there was 149,163 male students and 254,974 female students. In 2009, 8.1 percent of girls participated in gifted and talented education programs, compared to 7.4% of boys. According to the American Psychological Association, a study from Susan Voyer and the University of New Brunswick parents may assume boys are better at math and science so they might encourage girls to put more effort into their studies, which could lead to the slight advantage girls have in all courses, they wrote. Additionally, education hasn’t been a luxury that female students have had as long as it has been an opportunity for men. At one point, women were encouraged to stay in the home and provide for the family while men got their education to secure more lucrative jobs. However, since the 1980s after the U.S.’s first major wave in the push for equality for women, women have not only caught up but surpassed men in education even after high school. Between 2005 and 2015, the number of full-time male postbaccalaureate students increased by 24 percent, compared with a 25 percent increase in the number of full-time female postbaccalaureate students. Among part-time postbaccalaureate students, the number of males enrolled in 2015 was 6 percent higher than in 2005, while the number of females was 8 percent higher. While it could be that the focus of education has shifted in emphasis on female students, some male students, like freshman Roy Ortiz Carpio, still feel that challenging themselves is important, even if that means being the only boy in a class of 15-plus girls and the only one in a group of friends in Honors. Despite being outnumbered, Ortiz Carpio still feels that it’s important to take advanced classes even if that means being an outlier.